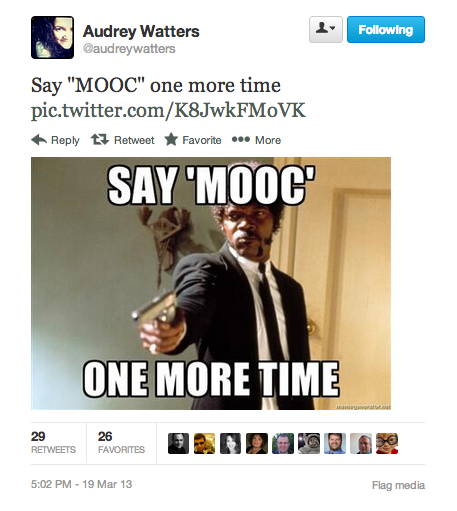 A few days ago Audrey Watters tweeted a Say What Again Meme about MOOCs. I pictured this particular Jules as a faculty member or instructional technologist finally freaking out on the administrator that is pressing him and the college to hurry up and join the future of higher education. Yes the MOOC craze could lead to gun violence. Believe it. Here’s another kind of MOOC crazy that I thought I’d share. This one comes from the Overlook Hotel where a number of higher-ed administrators went on a retreat to discuss MOOCs and plan for the future. A curious faculty member stumbled upon a draft of their white paper. To her horror this is what she discovered. Are you kidding me? This is the best thing I have ever seen on the internet! I love you! @Jim It’s all rainbows and unicorns – love. @Doug keep tweaking the MOOCers. They need to be slapped around. Strangely enough my first MOOC was about Gamification, which is playing around in a more serious setting. Still, I think the horror in MOOCs is rather the distance to any sensual experience than the missing playfulness. Playfulness you could induce in MOOCs; touching or feeling a touch, smelling, sensing an object or person, you can not imitate virtually. You can just remind the learner on experiences like this, which they have had in the past. This could work out. I think it is what ds106 sometimes tries, successfully I presume. UMW Eagle Eye model allow any faculty staff to drop a URL to feed external RSS feeds of their work. @Stefanie ds106 definitely has had a lot of success with a sense of play and my favorite example was the online version of the class taught by @Jim in the summer 2011, also known as “The Summer of Oblivion.” Jim role-played as a character from David Cronenberg’s Videodrome, Dr. Oblivion. There was an incredible response from the class as we collaboratively generated a narrative around this character across five weeks. Anyone could at any point take over the narrative thread and lead it to another place. I was truly amazing and I believe speaks directly to the sensory experiences you value. The other way to look at ‘play’ in the context of MOOCs which I had in mind is the idea that instructors are buying into a particular pedagogical model with the large MOOCs – short video lectures, professionally taped and fed to the class. The opportunity to experiment and play has been supplanted by this goal to brand an institution’s celebrity faculty. I believe the thinking is that if enough people stop and listen to these very thoughtful, smart faculty everyone will better for it. But there’s no unique experience for the learner in that, no opportunity to really contribute in the ways that are possible on the open web. The learner is just one of thousands processed through the LMS of the MOOC, and the work they produce isn’t discoverable and valued. My fear is that the race to MOOCs, and the corresponding love affair with the names and numbers associated with them is distracting administrators and faculty from what they should really be doing better understand what’s possible online. There’s no panacea to the future of online learning, and if faculty and administrators would be willing to become part of web culture – through tinkering, playing, and building – they’d more likely understand that. But with financial stresses and time limitations they don’t? Is that why? And they sadly look to outsource online education and possibly their futures with Coursera or Pearson. Choosing to not invest in their own faculty, staff, and infrastructure for teaching and learning is the real tragedy. Your deep thoughts about MOOC are very interesting. Do you communicate them anywhere else? I clearly can see the financial aspects around MOOC and this may be the reason so many people like watching the “celebrities”. I’m also still doing MOOC’s because I’m bored to death with the tasks the society I live in provides to me. These MOOC ‘s at least bring some spirit and interesting tasks into my life. In the case of ds106 I even welcome some nice new people and their blogs. @stefanie at the time I replied to your thoughts I didn’t realize that you’ve been participating in this semester’s iteration of DS106 and wished I’d know and spent time looking at your work. You’ve created a lot of great stuff, including my favorites Harmonium Love and the doctored Doctorow. I think the confidence and engagement that can be discovered in ds106 is one of it’s most important features. The level of interaction between individuals in the community has ebbed and flowed over the past few years, but it does persist. In particular I think Twitter has been a really important part of the relationship building process, and I did see that you were have problems with your account in your final post and hope you can sort them out. So much of what I discover these days is through the #ds106 and #ds106radio hashtags. (It’s through an Alan Levine tweet that I found your final post). The people that follow these tags and communicate with them are generally some of the most creative and welcoming people I’ve found online. And when a semester ends, there are people that remind you that ds106 is never over – and that’s what they mean by the whole #4life thing. Yes it’s a bit tongue in cheek, but it hasn’t stopped yet.